New Delhi: As chairman of placements at the Indian Institute of Management, Bangalore, Sourav Mukherji hasn’t worked so long and hard in recent memory. Prof. Mukherji’s eventual job is to find jobs for the MBA class graduating in 2010. So, instead of 60 prospective employers that were invited in 2007, he invited 200 to the campus in November for summer internship opportunities. His tactic seems to have paid off as the visits, which concluded on Saturday, yielded 100% placements. “At a time of economic slowdown, companies have more rigorous selection criteria and have raised their bars," says the professor. “The anticipated need for every company has visibly gone down. For a batch of 262, 100 companies placed offers, while last year, our batch of 240 needed just 60 companies to be placed." Still, even as more companies visited the campus, the average number of offers made by each one declined from four per company to 2.5. Mukherji says many regular recruiters skipped IIM-B this year because of cost-cutting measures and a freeze on recruitments. “We did expect this, so 50 of the 100 companies that placed offers were first-timers on the campus," he explains. It isn’t just IIM-B. This scenario has played out across all IIMs, India’s best management institutes that conducted summer placements this year. At IIM Ahmedabad, where summer placements are still on, officials say they expect a repeat of the Bangalore experience. “We too have approached more companies than last year but not as many as the other IIMs. We also expect the number of offers placed per company to go down but, even if we manage an average of three, I think we are going to be fine," says Arvind Sahay, a marketing professor. Offers from the finance sector took a hit at IIM-B and Sahay is expecting a similar situation. “The times are good for marketing jobs and there is no reason why there should be any dearth of openings," says Sahay. At IIM Lucknow, where summer placements began on 8 November, about 100 companies have visited the campus up from 60 or so last year. “We have adopted the strategy of reaching out to (a) maximum (number of) companies we can so that students have maximum choice. However, the number of offers has definitely stagnated, even though not declined, compared with last year," says Sushil Kumar, chairman of placements. At other IIMs—Kolkata, Indore and Kozhikode—where summer placements saw a rise of at least 25% in top and average stipends offered for the two-month internships, the number of offers per company declined as well, particularly in finance. “The students have been placed in investment banking, consulting, general management, marketing, media and private equity. We saw more companies visiting us compared with last year," said an official at IIM Kozhikode who declined to give specific numbers and insisted on not being named. IIM Kozhikode students received about 14 international offers against four last year. 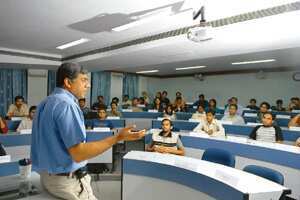 IIM Kolkata placed 300 of its students with 110 companies. For Savita Mahajan—deputy dean at the Indian School of Business in Hyderabad, which will conduct its final placements in December—the key is to provide students with the maximum choice. “Our allegiance is to our students," she says. “Whether companies get what they want depends on the market but our job as a B-school is to ensure the maximum number of companies on the campus, especially at a time when jobs are sinking."